Pf withdrawal can be done online and offline (physical application submission) modes. Before learning how to withdraw pf online, lets see when you can withdraw epf balance. Epf was established with the aim of providing adequate retirement saving fund. You should not withdraw it for unnecessary reasons. You should look for this balance only in case of medical emergencies and children education etc. Having said that you can withdraw pf balance in following circumstances as per epf withdrawal rules. You can withdraw the balance in full or partial. EPFO has laid down clear conditions for withdrawal. When an individual retires from employment. When an individual remains unemployed for a period of 1 month, he/she can withdraw 75% of their funds and keep the account active. You can also withdraw the remaining 25% of their funds for final settlement of the account after completion of two months of unemployment. For this a gazetted officer should certify this fact. I have explained complete pf withdrawal rules in my next post. Please read it for other rules and conditions. Now lets see how to withdraw pf balance online. You can learn how to Check PF Balance in my other post. You can use Pf withdrawal online facility only if your Aadhar is linked with your UAN Number. 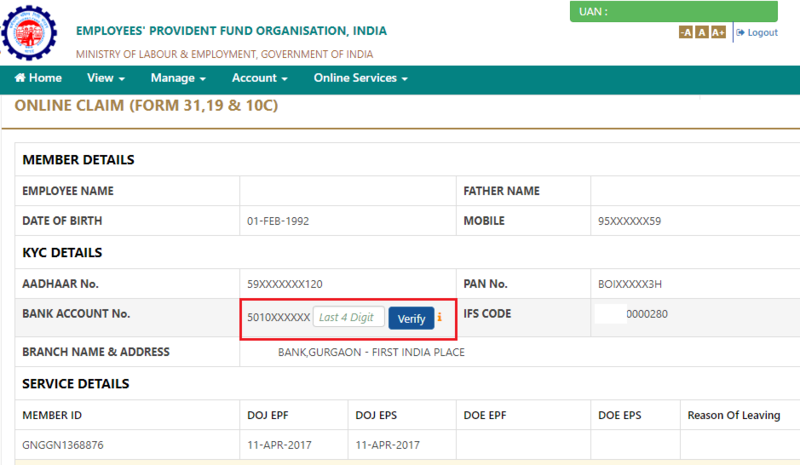 Earlier you will require employer signature for epf withdrawals but now you can withdraw epf balance without employer signature. 1. UAN Number Registration is required to access UAN Member Portal. 2. You should know your UAN Member e-sewa portal password along with UAN. If you don’t know password, please read my post Forgot UAN Password. 4. You should complete eKYC process by adding Aadhar number, PAN number, Bank Account Number and IFS Code. Once you complete these tasks, you can proceed with pf withdrawal process. Step 2: Click on ‘Online Services’ Tab which is one among the menu bar items. It will pop out 3 options. Among them, click on Claim (Form 31, 19&10C) link. Step 3: It will display all the personal information of employee to verify the correctness of information. If everything is correct, enter the last 4 digits of bank account number for verification and then click Verify button. If the number is correct, you will get a popup information. Step 4: Now click on Yes. It is a confirmation from your end that the displayed bank details are yours and the withdrawn amount will be credited to the specified account. Step 5: Now click on ‘Proceed for online claim’ option. Then it will display some options which you need to select. Step 6: Select ‘Pf Advance (Form 31)’ from drop down menu beside ‘I want to apply for’ option. It is an option to withdraw pf balance online. You can select any of the following options depending upon your need. You should know that the option which you are not eligible for will not be displayed here. Step 7: You have to select ‘Purpose for which advance is required’ from drop down menu. You must select the true purpose among those options. The reasons are – Non receipt of wages (>2 months), Illness, Natural Calamities, Power Cut, Purchase of handicap equipment, Construction of house, marriage, higher education & 90% withdrawal before retirement. Here you can observe that the purposes for which you are not eligible to withdraw pf balance are marked in red color with corresponding reasons. So, you can choose to withdraw balance for those purposes. Step 8: After selecting the true purpose, enter the ‘amount of advance required’ in provided box and enter the employee address. Step 9: Click the check box for confirmation of terms and conditions. Once you done filling the form, click on ‘Get Aadhaar OTP’. OTP will be sent to the mobile number registered with your Aadhaar card. Enter the OTP for final submission of Epf partial withdrawal claim. Step 10: Now the employer will receive the withdrawal claim from you for employer approval. If he has no objection, he can approve the request. Once approved, the PF withdrawal amount will be credited to your bank account linked with UAN Number within 10 to 20 days. This is how to withdraw pf online with UAN Member Portal. Now lets see how to withdraw epf balance by submitting physical forms to EPFO Office through offline mode. You can apply for epf withdrawal offline as well by submitting composite claim form which serves the purpose of full final settlement, partial withdrawal of pf balance and pension withdrawal. You can download 2 types of claim forms. 1st one is Aadhar based composite claim form and the 2nd one is Non Aadhar composite claim form. For aadhar composite claim form, you don’t require attestation. For non-aadhar composite claim form, you need to get attested by your employer. You can access all types of Epf Claim Forms. Just fill the composite claim form and Annexures to be attached with the claim form for withdrawal and submit them to your employer for onward submission to local epfo office. You better know all the pf claim forms related to provident fund withdrawal. I will explain these forms briefly here under. You read my next post for detailed explanation about these forms. For Partial withdrawal / advance, you have to use pf withdrawal form 31. In case of withdrawals for emergencies, this form is applicable. This form is useful for complete withdrawal of pf balance at the time of retirement. You can withdraw the pension portion of Employer Epf Contribution by submitting form 10c. If you are withdrawing your PF balance with unemployment reason, you have to fill Form 31 and Form 10 C.
1. How to check PF Withdrawal status? Ans: Once you login to UAN Portal, Click on ‘Online Services’ menu tab. It will display few options. Among them click on ‘Track Claim Status’ link. It will display all the claim requests you made and their status under each section. 2. What does “PF withdrawal status not available” mean? Is it rejected? Ans: It means nothing but the epfo has not updated the status yet. You just need to wait for the update. It doesn’t mean your pf withdrawal request was rejected. 3. The online PF withdrawal request status shows,“Claim Settled”. But I didn’t receive money in my bank account. What should I do now? Ans: When you submit withdrawal request online, it is called ‘Claim Receipt Date’. Once the claim the is accepted by epfo, it will be mentioned as ‘dispatch date’ on claim status page. Once epf has accepted your withdrawal claim, it mark the status as ‘Claim Settled’. But it will take to 2 to 3 days from dispatch date mentioned to receive funds in your bank account. 4. How do I cancel a PF withdrawal request submitted online? 5. What are the documents required for PF withdrawal? 6. Is PF Withdrawal Taxable? Ans: EPF withdrawal made before completion of 5 years of service is taxable at the slab rate applicable to the individual. If EPF withdrawal is made after 5 years of service, you don’t need to pay tax on pf withdrawal. 7. How to show Pf Withdrawal in Income Tax Return? Ans: Withdrawals made after 5 years of continued service is exempt under Sec 10(12). You can show this exempted pf withdrawal amount in ITR 1. For that, you need to go to ‘Taxes Paid and Verification’ Tab in ITR 1. In this tab, you find a section titled ‘Exempt Income(For reporting Purposes)’. You have to select the options provided under others. Select ‘Nature of Income’ drop down menu and chose ‘Sec 10(12) – Recognised Provident Fund Received’ option and enter the amount that you received in amount box. In case of unexempted income, which is taxable at the slab rate applicable to you, you must show it as ‘Income from Other Sources’. Total amount that you should enter will be ‘PF Withdrawal Amount + Deduction Claimed for EPF Contributions in Previous Years under 80C’. 8. How many days required for pf withdrawal? Ans: It depends but usually you can expect withdrawal amount in 7 to 20 days. 9. how to withdraw pf online without UAN? Ans: It is not possible to withdraw pf balance online without UAN.